When my husband and I realized we had a day off together without plans, I knew it was time to get a little creative. So I planned a themed road trip: Journey To Mars. It was a great little trip to get out of the house for a few hours. We met some very nice locals too and were able to enjoy an afternoon just exploring. I’ve heard of Mars Pennsylvania before. I always thought it had a fun name and I knew it wasn’t far too from us. While looking at Roadside America, I noticed Mars listed as being worth a detour. So I did a little research and came up with our trip. Mars Pennsylvania is like a lot of small town America. Home to a little downtown area of storefronts. Boasting businesses like China House, Mars Hardware, Rite Aid and a few other random mom & pops. Mars was founded in 1876 and incorporated as a borough in 1895. 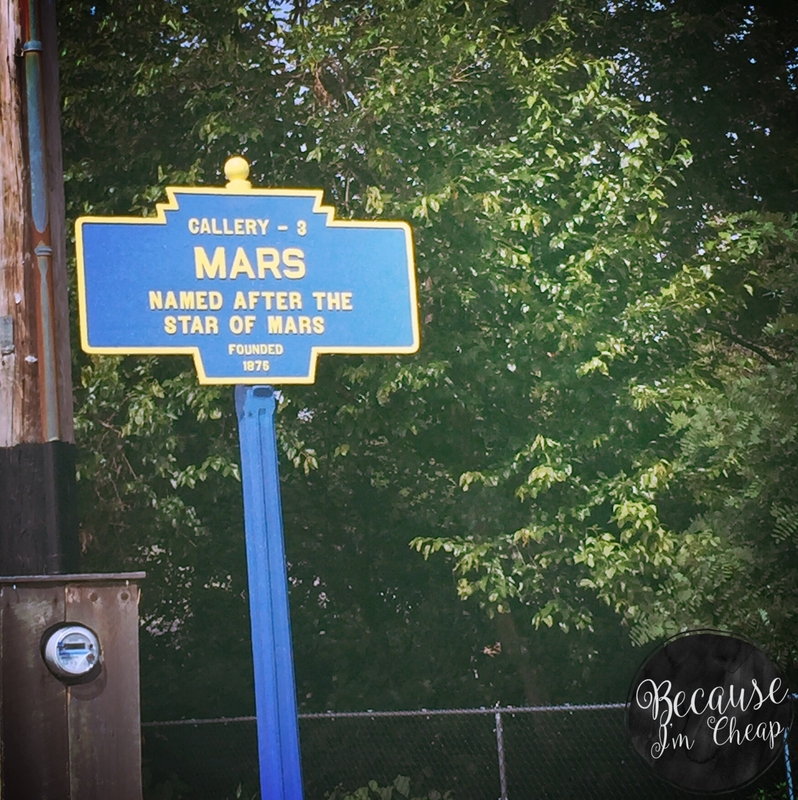 It’s unclear why Mars was named after “the star of Mars.” Some believe it was the town founder’s (Samuel Parks) love of astronomy. Sorry, Samuel, Mars is a planet but it’s cool, we will let that one fly. Another interesting trivia fact about Mars is that the USS Mars was named after the little borough. It was a part of the United States Pacific Fleet in the early 60s through the 90s. Then sunk as a target practice in 2006. 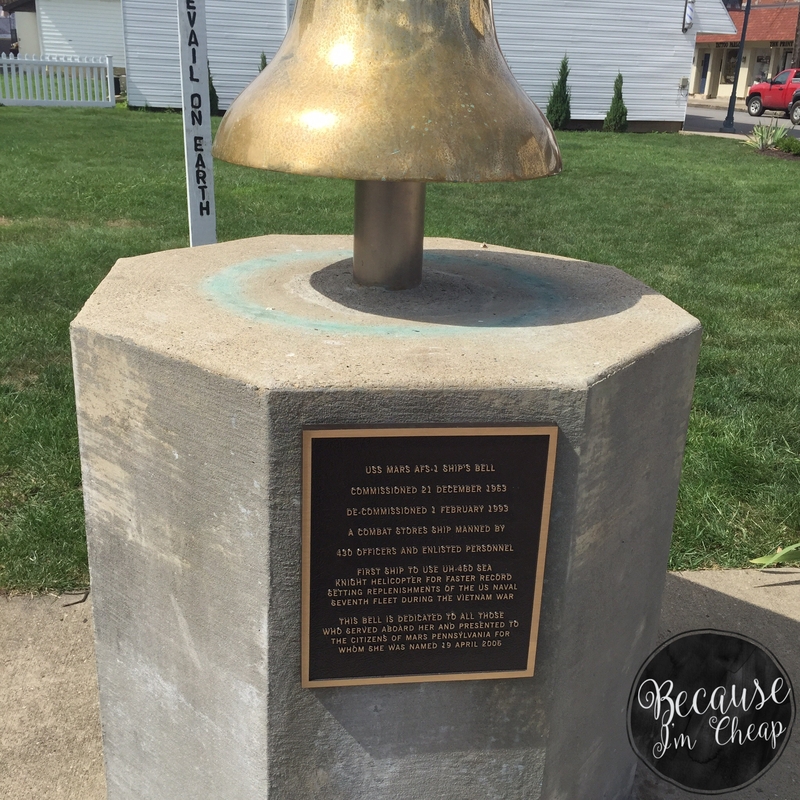 The vessel’s bell is displayed proudly downtown. Residents of Mars are known as Martians, or Planets. As that’s the mascot of the local sports teams. Speaking of schools, in 2011 the students from Mars Elementary School were personally invited by Disney to attend the premiere of Mars Needs Moms. It’s also been a location of a few films such as The Prince of Pennsylvania and Kingpin. A few famous Martians call Mars home as well, Gino Crognale of The Walking Dead, 1940s actor William Eythe and actress Jillian O’Neil. 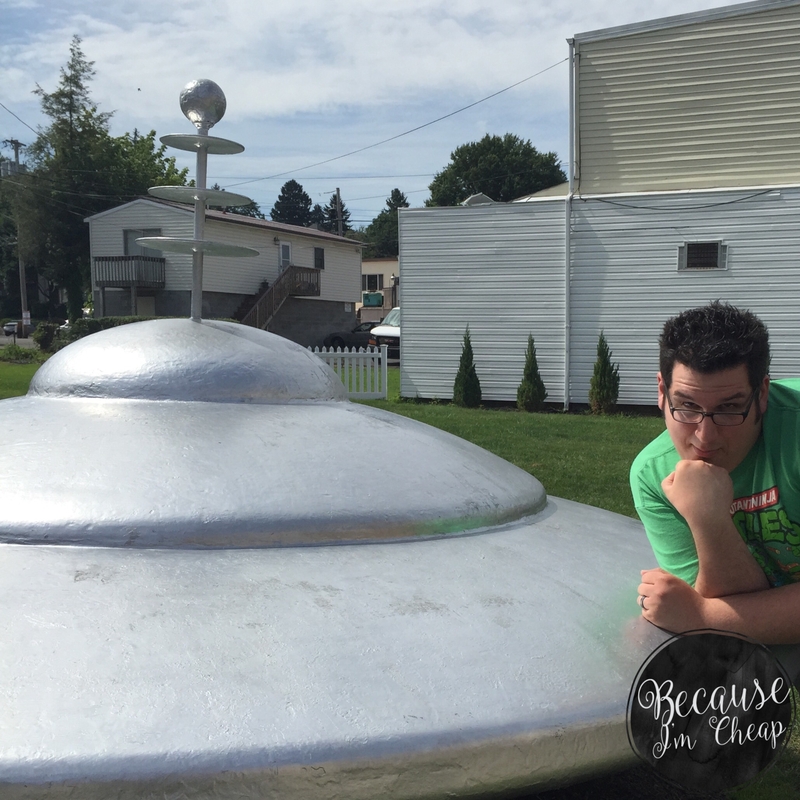 For our “Jouney To Mars” road trip, we spent our time downtown exploring. 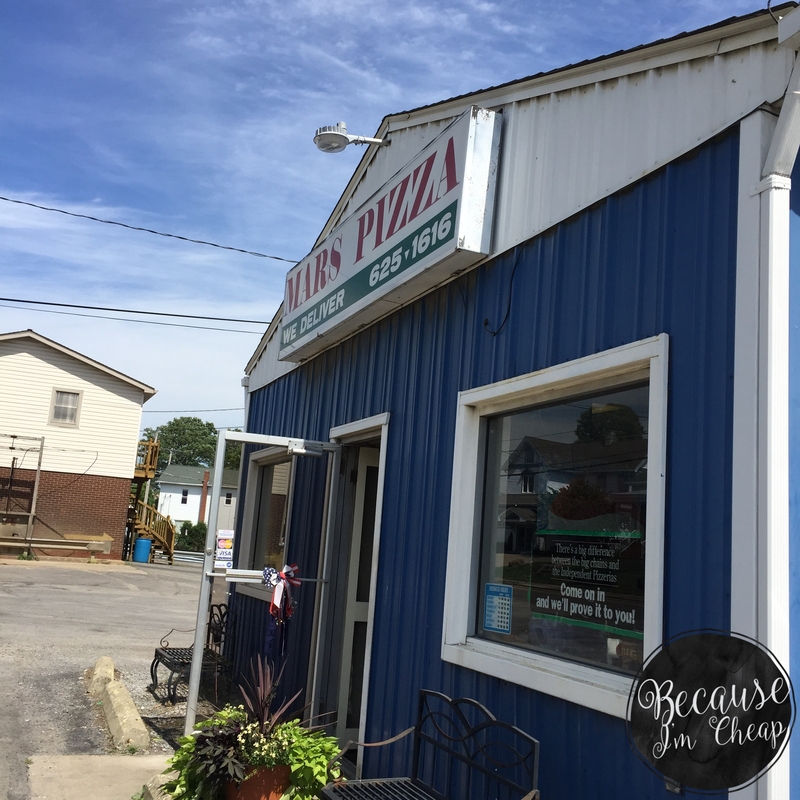 First we went to Mars Pizza for lunch. There’s nowhere to sit inside, but there are two benches outside to wait at. We opted to wait in the car rather than watch the passing traffic. 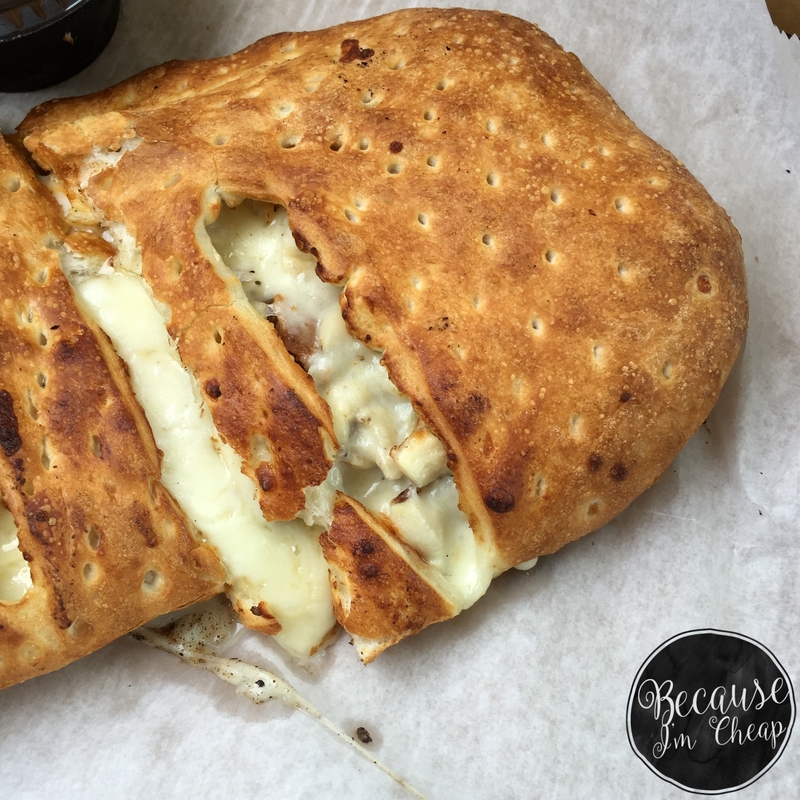 Our calzones were fresh & ready in under 15 minutes. Bryan said it was the best Martian pizza he’s ever had ????. I was pleased. The calzone was big enough for two good sized meals for me. At $8.95 each, it was a good deal for me for such big portions. After lunch, we drove to the downtown area. Only about 2 or 3 blocks away. We weren’t sure what we were looking for next until we saw it. Yep. 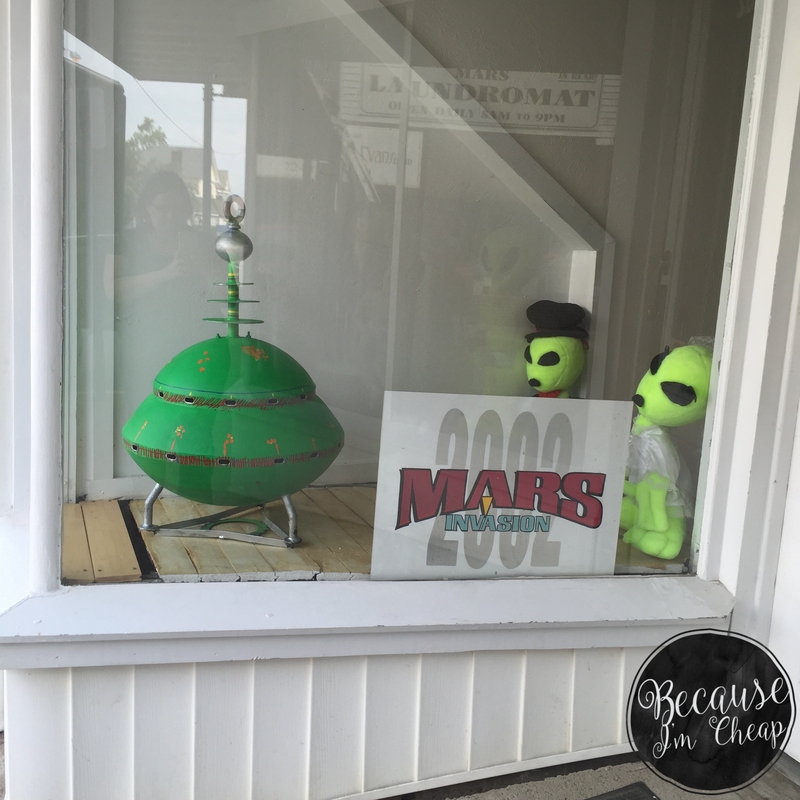 Several storefronts in the downtown area are host to aliens. I wish one of them had been an actual novelty shop or Area 51 style museum, but sadly not. But it was still entertaining to hunt for aliens. If anyone wants to go into a creative business, open one for me, please. I promise to visit! Several businesses in Mars capitalize on the town’s name as well. 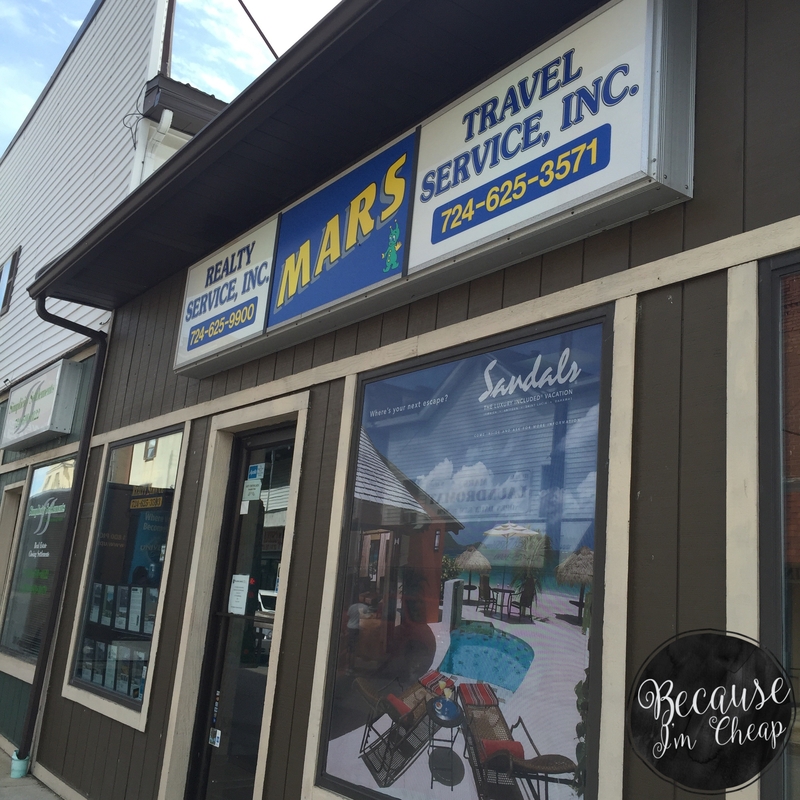 Like Mars National Bank, Mars Travel and Mars Brew House to name a few. Most of them incorporating a flying saucer or little green men. That’s a win in my book. Love the kitschy styling whenever I can get it. 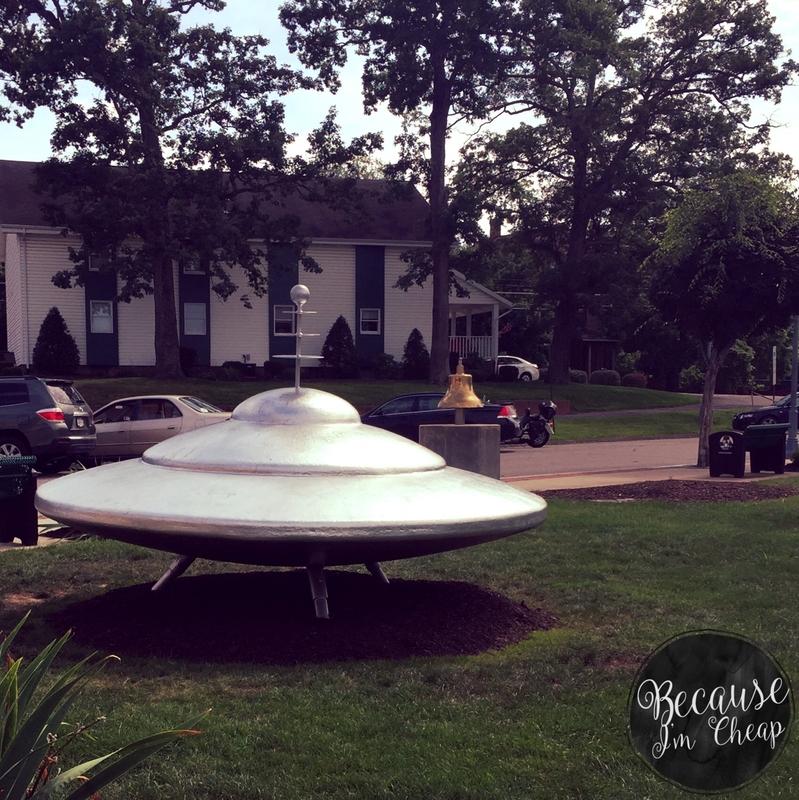 There’s a model UFO “parked” in an open area right down town. It’s glossy and shiny paint is an eye catcher for sure! As far as I can tell, there’s no real story behind its existence. It popped up in the early 90s, during the same time UFO sightings had been reported in the nearby area. 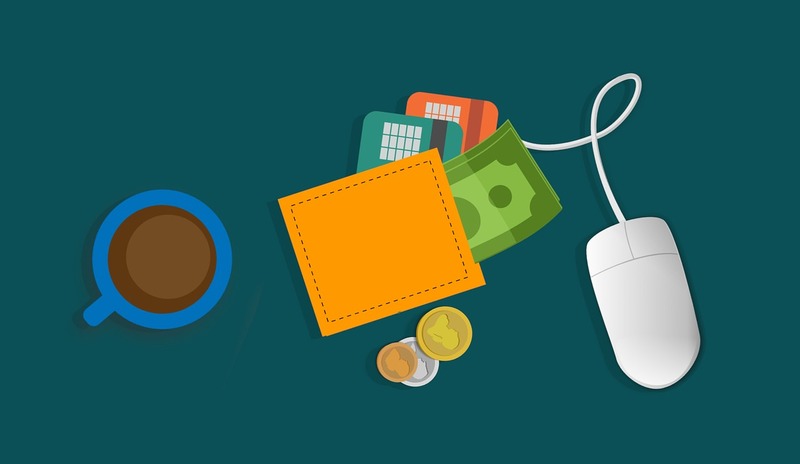 Possibly the Chamber of Commerce trying to attract visitors? I’m not too sure. 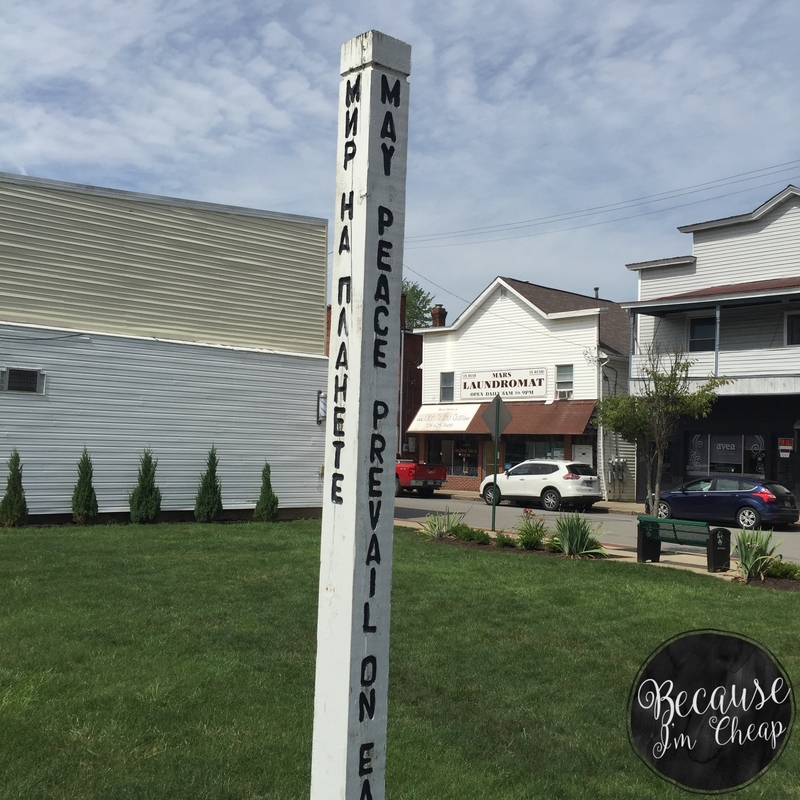 In the same field area there is a wooden sign post that reads, “May Peace Prevail On Earth” in 4 different languages. 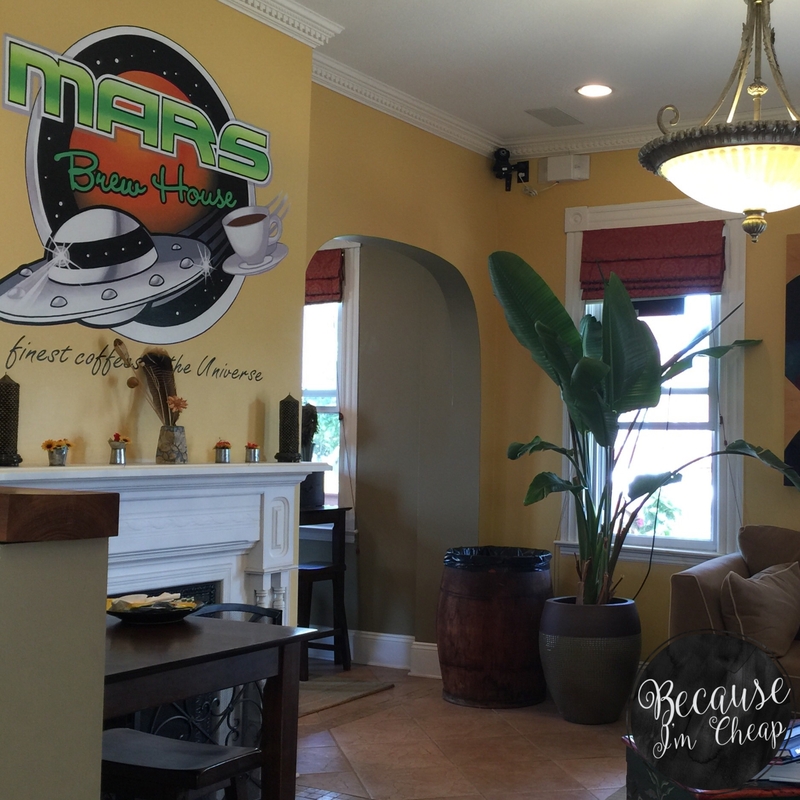 Right next door to the UFO is a lovely coffee house called Mars Brew House. By lovely, I mean that in every sense of the word. This is easily my new favorite coffee shop in the universe. This place was so relaxing and homey. It was like visiting a good friend’s home for a cup o joe. The gentleman who prepared our frozen coffee was just as welcoming. He even informed us that NASA had been in town recently for a Mars festival. I think we will be back for that for sure! 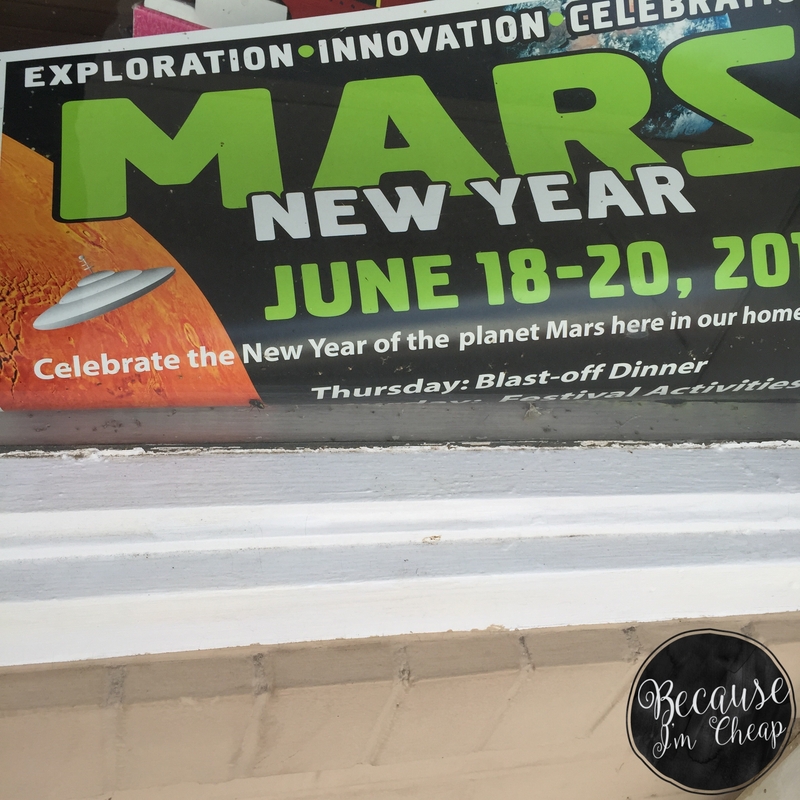 We wrapped our trip to Mars on the front porch of the Brew House. 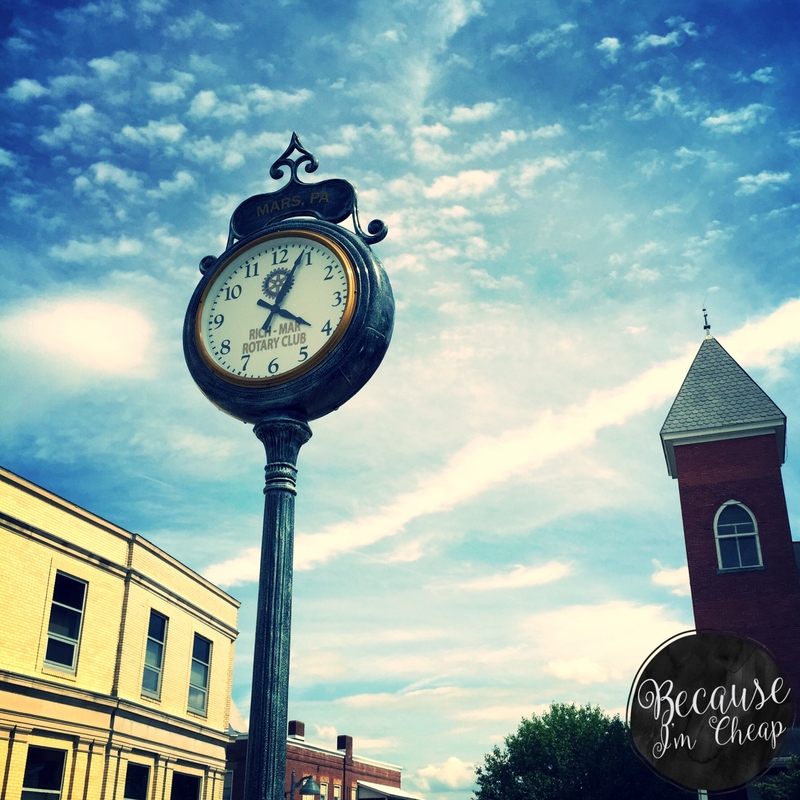 Just relaxing and enjoying a few quiet moments in small town America. 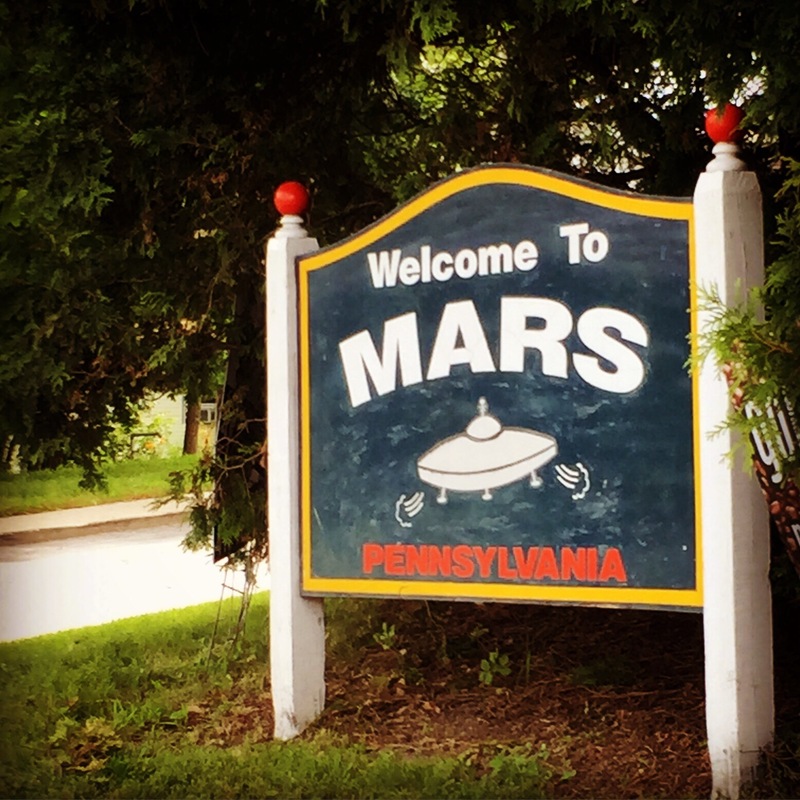 If you’re in the area and looking to kill some time, make a detour over to Mars Pennsylvania. Act like a tourist and take some cheesy photos. 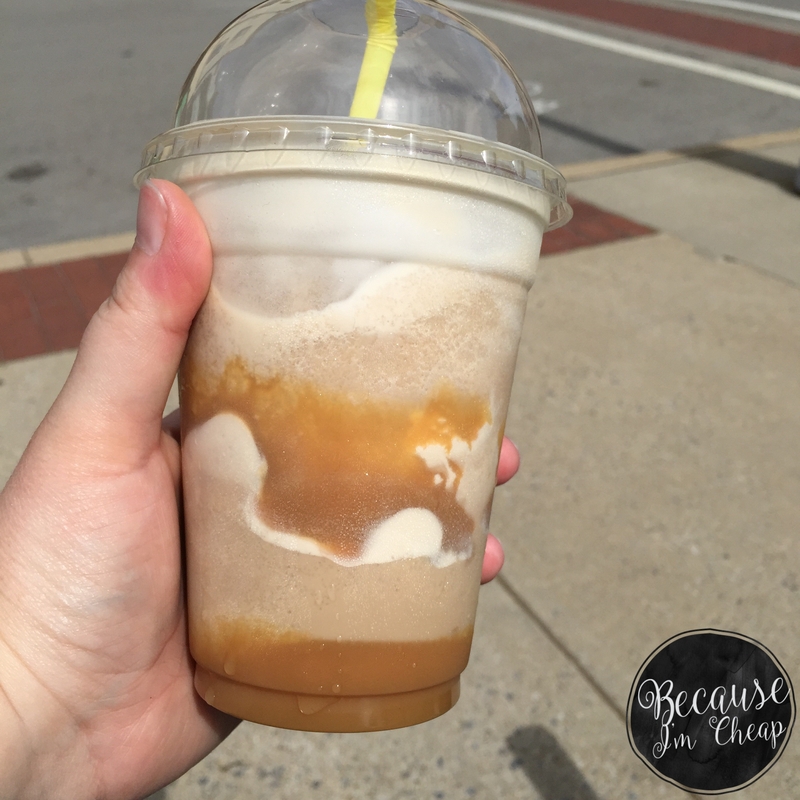 Or step back from the busy-ness of everyday life and relax on the porch sipping frozen caramel coffee. You won’t be disappointed. Do you enjoy offbeat travel? Make sure to follow along, more adventures coming soon! Niagara Falls ~ Keeping it on the American Side on the cheap! I love exploring with my husband. 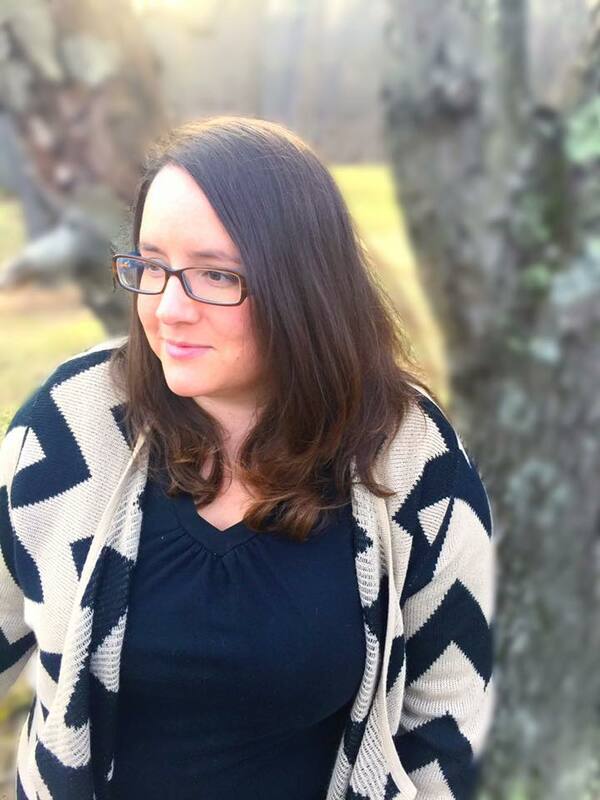 Thank for sharing your out of this world experience in Mars at the #AnythingGoes Link Party. Thanks for stopping by, Sandy. Nothing better than a little adventure with your other half! I pass through this area once or twice per year on my way to visit “back home” just outside of Harrisburg. We’ll have to plan some extra time into the next trip to check some of these places out. Thanks for sharing! 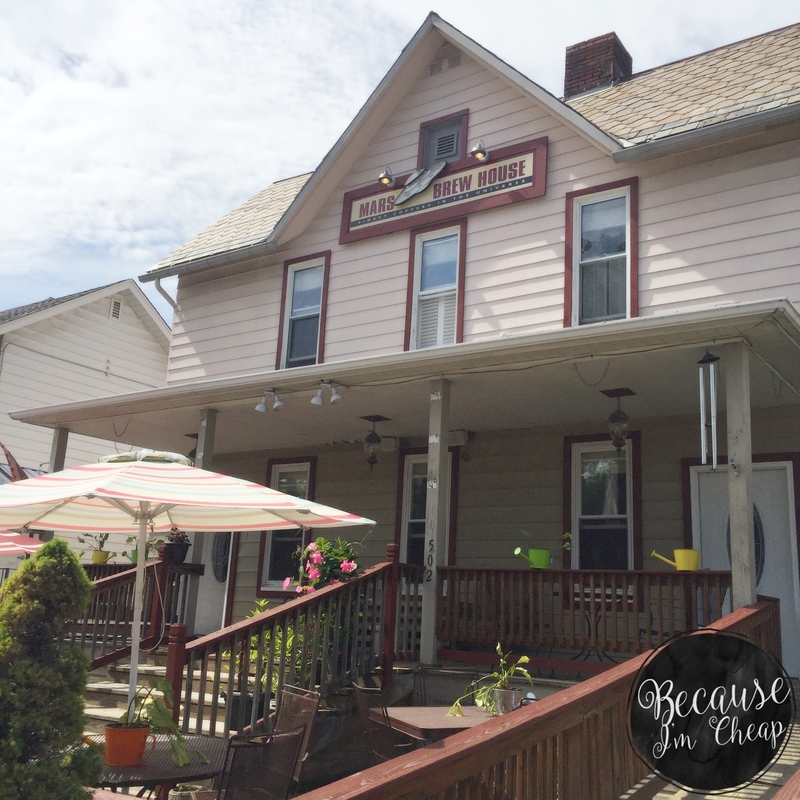 You should definitely try the coffee house. I’ve never felt so at home in a place of business. And the coffee is great too! It must be a common theme. 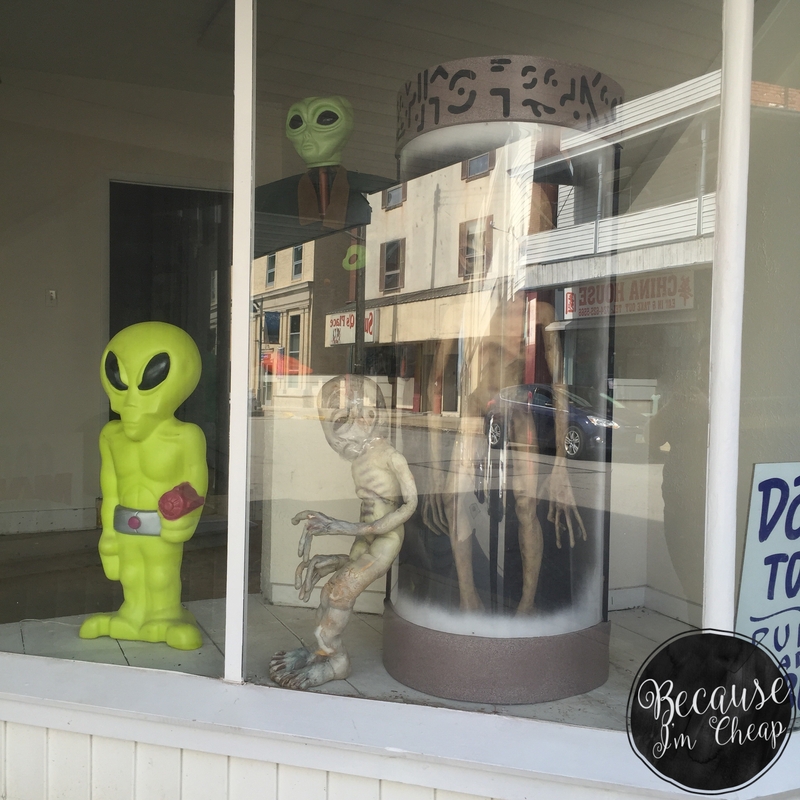 We have a town which is a UFO capital and we too have hokey signs and statues. I love hokey things! Someday I want to see some of the old tourist “traps” along Route 66.